Sometimes I forget the importance of wearing sunscreen in the colder months. In the past, I always associated sunburns with the hot sunny weather. However, last year I was educated and painfully! John was out of town so I bundled up to go shovel the driveway so I could get my car out and go to the store. I bundled up in my hat, boots and mitts and spent about 45 minutes clearing heavy snow from behind my car. I knew a few hours later that I had forgotten one very important thing: sunscreen. It didn’t even cross my mind to put some sunscreen on my face. My skin is very fair and burns so easily. Let’s just say I go right from pasty white to lobster red skipping the golden tanned skin. Needless to say, I will never forget to wear my sunscreen this winter and so far I’ve kept to that resolution. This winter I’m wearing SunZone sunscreen and I’m happy to report my skin is burn free! SunZone has only recently launched and is a brand new product that is not even in stores yet! You’ll be able to buy it online on Amazon this month and in stores beginning in March. SunZone is Canadian and is proud to be the only manufacturer that formulates, develops and produces a complete line of sunscreen. Wait till you see their product line-up. I love how diverse it is and appeals to a variety of needs! SunZone Work SPF 60 Lotion: If you’re working outdoors, this sunscreen is a must. It comes in a oil free, paraben free, PABA free lotion that is also water resistant. It’s made using a patented Oleosomes Technology that is derived from plant seeds. What this basically does is gives your skin long lasting moisturization, greater protection using less active chemical. I love that it’s not greasy and absorbs almost instantly into your skin. I hate the feeling of thick, heavy sunscreen on my skin. After applying this lotion, I don’t even realize I’m wearing it. My skin just feels smooth, soft and protected from harmful UVA/UVB rays. I wore this sunscreen when I was out shoveling a path to my oil tank so the driver wouldn’t have to wade through the snow. I spent about an hour outside and was sweating from the exertion. I didn’t burn nor did my face feel rough and dry from the cold wind. 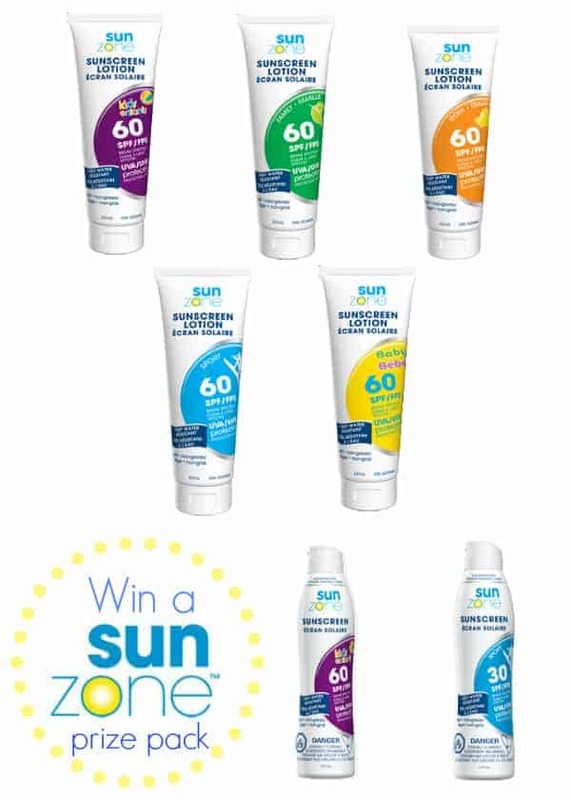 SunZone Sport SPF 60 Lotion: For those of you who play outdoor sports or like to exercise outside, SunZone SPF 60 Lotion will provide you maximum protection from the sun’s harsh rays and is very water resistant. Like all SunZone lotions, it contains natural ingredients like Aloe, Vitamin E and Green Tea extract as well as using the Oleosomes Technology. I don’t play outdoor sports, but I do enjoy going out for a walk when the weather is half decent. My mom enjoys downhill and cross country skiing so I’m telling her to pick herself up a bottle when it’s available in stores. You can also find this lotion in SPF 15 and 30. SunZone Sport SPF 30 Clear Spray: You can also use a clear spray format which provides the same benefits, but also allows you to cover those harder to reach areas. It goes on as a light mist that absorbs into your skin. It’s non-greasy and skin feels soft and moisturized. Like the lotion, it’s also very water resistant. I think the spray will come in very handy in the summer when I’m heading to the beach and have to apply sunscreen to my back. The spray also comes in SPF 30, 45 and 60 as well as a mini-spray. SunZone Family SPF 60 Lotion: This lotion provides maximum protection from sunburn and UVA/UVB rays for the entire family (including kids). It contains all the benefits of a SunZone lotion (ie. not greasy, natural ingredients). All SunZone lotions are also hypoallergenic and won’t clog your pores. This is my personal go-to sunscreen for day to day wear. I put it on everywhere after my shower. I like that it doubles as a moisturizing lotion and a sunscreen. I have very sensitive skin and I’ve had no issues whatsoever with any of the SunZone products I’ve tried. I’m also at the age when I’m worrying more about wrinkles and aging so I like that it keeps my skin moisturized and protected. You can also find it in SPF 15 and 30 as well as the clear spray format in SPF 30, 45, 60 and mini spray. 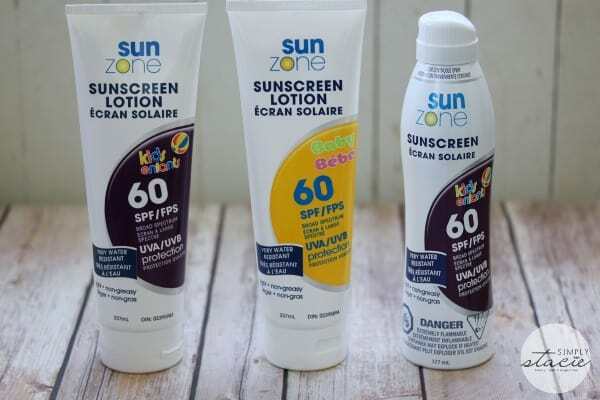 SunZone Kids SPF 60 Lotion & Clear Spray: SunZone also has designed a lotion and clear spray just for kids. My daughter, Bridget, is 9 years old and is fair skinned too. I always have to slather on the sunscreen with her so she won’t get burned. She loves to play outside and is a very active girl. As parents, we need to remember to put on sunscreen when kids are going out to play in the snow. The sun reflects off the snow and can burn any exposed skin. The lotion is also available in SPF 15 and 30 while the clear spray comes in SPF 45, 60 and a mini spray. SunZone Baby SPF 60 Lotion: This lotion is specifically formulated for baby’s skin. Though I don’t have a baby, I do remember the importance of putting sunscreen on my baby’s skin. I’m going to passing this lotion on to John’s mom who runs a home daycare and has a couple babies that she takes care of. It also comes in SPF 15 and 30 lotion. I appreciate the well-rounded group of products SunZone offers and that they work! Not only does my skin feel soft, but it also smells nice. I feel better knowing that both mine and my family’s skin is protected. The lotions and sprays are non-greasy, lightweight and make my skin feel amazing. The products are an ample size with the lotion at 237 mL and spray at 177 mL. A little bit goes a long way so they will last me for awhile I’m sure! 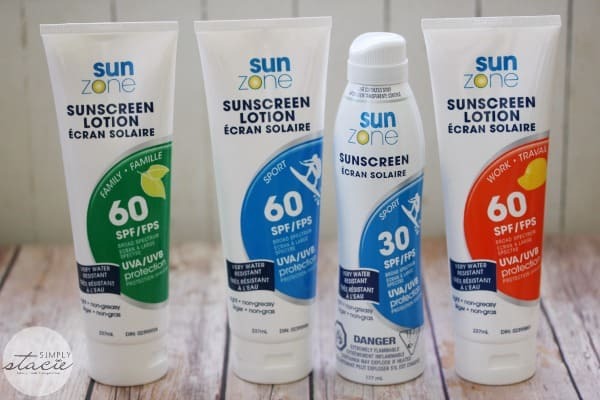 SunZone products have a SRP of $9.99 each and will be available to purchase on Amazon later this month and in stores across Canada in March. One store that I know where you can buy them is at Mark’s Work Wearhouse. The SPF 60 for my grandson when he visits me in FL. The SPF 60 spray for ease of use.. I would LOVE to try the Sport SPF 60 Spray!!!!!! The Sports SPF 60 would be my first choice. Sports SPF60 Clear Spray sounds great! I’m most interested in the SPF 60 clear spray. The clear sports spray for me! I like to try the SPF 60 clear spray. SPF60 Lotion! That’s a lot higher than most of the baby sun lotions that I’ve seen. The kids 45 spf lotion looks great! I am really looking forward to trying the Sport spf 60. Thanks for the giveaway…we like the Work 60 SPF Lotion.